November 13, 2012 by S. P.
Bringing the Gospel of Luke to Life: Insight & Inspiration. By George Martin. Our Sunday Visitor, 2011. 697 pages, paperback. $24.95. St. Jerome tells us that ignorance of Scripture is ignorance of Christ. St. John tells us: “In the beginning was the Word, and the Word was with God, and the Word was God” (Jn 1:1). To know God we must know His Word. As Christians, our Bible should never sit on the shelf gathering dust. Our Bible should be the most read book in our possession; it is most certainly the most important book in our possession. Yet, unfortunately many Christians remain personally ignorant of its contents. Many people set out with very good intentions to read the Bible, but often get only a few chapters or few books into it before giving up. They quickly become overwhelmed with unfamiliar people, places, and happenings. This is where a good Bible commentary comes in handy. It allows us to “walk along” with someone more familiar with the Bible as he leads us through it, helping us make sense of what was once terra incognita. 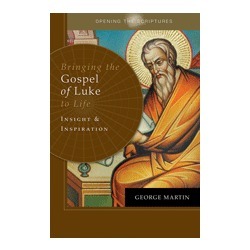 George Martin’s book, Bringing the Gospel of Luke to Life, is exactly this sort of “walk along” with an expert. He takes us verse by verse through the Gospel of Luke, helping us better understand every word of the Evangelist. Each chapter of the book corresponds to the same chapter in Luke. We are presented with a brief “Orientation” which highlights key points of a group of passages. This is followed by “Preface” consisting of several verses of Luke along with Old Testament references and where applicable, New Testament parallels. Next is a verse by verse commentary on the verses in the “Preface.” The end of the book contains a brief essay situating Luke within the canon of Scripture. Overall, this commentary is excellent and quite useful. However, there are a few minor critiques. First, the commentary uses the New American Bible with Revised New Testament and Revised Psalms text. The NAB is an “idea for idea” translation, meaning the translators attempt to capture the “essence” of the original passage. On the other hand the RSV-CE is a more “word for word” translation, meaning the translators attempted to preserve as best as possible the actual wording of the original passage. A translation like the NAB is sometimes easier to read, but since it’s the “essence” of the original, we are left with someone else’s interpretation of what the original author meant, not necessarily with what he actually wrote. The vast majority of serious Bible scholars rely on “word for word” translations. The second minor critique involves a lack of maps and charts/outlines. At least a basic map would have been helpful. Also, having a basic chart or outline of the Gospel would have been helpful as well. These minor criticisms aside, Bringing the Gospel of Luke to Life is an great commentary and “guided tour” of the Gospel of Luke. This review was written as part of the Catholic book reviewer program from The Catholic Company. Visit The Catholic Company to find more information on Bringing the Gospel of Luke to Life . The Catholic Company is the best resource for all your family Advent activities and supplies this year, such as Advent wreaths and calendars for kids, as well as Christmas decorations such as nativity scene sets and religious Christmas gifts for the whole family. 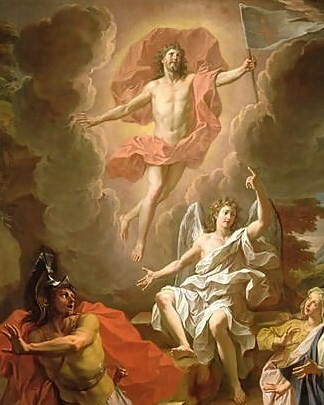 April 8, 2012 by S. P.
The Lord is truly risen, alleluia. To Him be glory and power for all the ages of eternity, alleluia, alleluia. O God, who on this day through your Only Begotten Son, have conquered death and unlocked for us the path to eternity, grant, we pray, that we who keep the solemnity of the Lord’s Resurrection may, through the renewal by your Spirit, rise up in the light of life. Through our Lord Jesus Christ, your Son, who lives and reigns with you in the unity of the Holy Spirit, one God, for ever and ever. March 18, 2012 by S. P.
Among the truths which faith teaches us, there are several which all ought to know and believe explicitly, namely, the existence of God; the Mystery of the Holy Trinity; the Mystery of the Redemption of mankind by the Incarnation and death of Jesus Christ, and the future state of reward and punishment. There are things which every Catholic is also bound to know by the express command either of God or of the Church. These things are: 1.) The three most ordinary Catholic prayers, namely, the Lord’s Prayer, the Hail Mary, and the Apostles’ Creed; and also, at least in substance, 2.) The Commandments of God; 3.) The Precepts of the Church; 4.) The Doctrine of the Sacraments, and especially of these three which are necessary to everyone, namely, Baptism, Penance, and the Holy Eucharist; 5.) The duties and obligations of one’s state in life. It is a mortal sin for a Catholic to be ignorant of these things, if it be through his own willfulness or neglect. March 7, 2012 by S. P.
What Will the Church Look Like? [T]he big talk of those who prophesy a Church without God and without faith is all empty chatter. We have no need of a Church that celebrates the cult of action in political prayers. It is utterly superfluous. Therefore, it will destroy itself. What will remain is the Church of Jesus Christ, the Church that believes in the God who has become man and promises us life beyond death. The kind of priest who is no more than a social worker can be replaced by the psychotherapist and other specialists; but the priest who is no specialist, who does not stand on the sidelines, watching the game, giving official advice, but in the name of God places himself at the disposal of men, who is beside them in their sorrows, in their joys, in their hope and in their fear, such a priest will certainly be needed in the future. Let us go a step further. From the crisis of today the Church of tomorrow will emerge – a Church that has lost much. She will become small and will have to start afresh more or less from the beginning. She will no longer be able to inhabit many of the edifices she built in prosperity. As the number of her adherents diminishes, so will she lose many of her social privileges. In contrast to an earlier age, she will be seen much more as a voluntary society, entered only by free decision. As a small society, she will make much bigger demands on the initiative of her individual members. Undoubtedly she will discover new forms of ministry and will ordain to the priesthood approved Christians who pursue some profession. In many smaller congregations or in self-contained social groups, pastoral care will normally be provided in this fashion. Alongside this, the full-time ministry of the priesthood will be indispensable as formerly. But in all of the changes at which one might guess, the Church will find her essence afresh and with full conviction in that which was always at her center: faith in the triune God, in Jesus Christ, the Son of God made man, in the presence of the Spirit until the end of the world. In faith and prayer she will again recognize her true center and experience the sacraments again as the worship of God and not as a subject for liturgical scholarship. The Church will be a more spiritual Church, not presuming upon a political mandate, flirting as little with the Left as with the Right. It will be hard going for the Church, for the process of crystallization and clarification will cost her much valuable energy. It will make her poor and cause her to become the Church of the meek. The process will be all the more arduous, for sectarian narrow-mindedness as well as pompous self-will will have to be shed. One may predict that all of this will take time. The process will be long and wearisome as was the road from the false progressivism of the eve of the French Revolution – when a bishop might be thought smart if he made fun of dogmas and even insinuated that the existence of God was by no means certain – to the renewal of the nineteenth century. But when the trail of this sifting is past, a great power will flow from a more spiritualized and simplified Church. Men in a totally planned world will find themselves unspeakably lonely. If they have completely lost sight of God, they will feel the whole horror of their poverty. Then they will discover the little flock of believers as something wholly new. They will discover it as a hope that is meant for them, an answer for which they have always been searching in secret. And so it seems certain to me that the Church is facing very hard times. The real crisis has scarcely begun. We will have to count on terrific upheavals. But I am equally certain about what will remain at the end: not the Church of the political cult, which is dead already with Gobel, but the Church of faith. She may well no longer be the dominant social power to the extent that she was until recently; but she will enjoy a fresh blossoming and be seen as man’s home, where he will find life and hope beyond death. In the traditional calendar March 7th is the Feast Day of St. Thomas Aquinas (c. 1225 – 1274), the Angelic Doctor of the Church and Patron Saint of Catholic schools, scholars, theologians, and booksellers. Studying under St. Albert the Great at Cologne from 1248 to 1252, St. Thomas’s large frame and quiet demeanor led to fellow students dubbing him the “Dumb Ox.” This “Dumb Ox” went on to become arguably the greatest theologian of the Church. Among his voluminous works, Summa contra Gentiles and the Summa Theologiae represent the high points of scholasticism, remaining unsurpassed in scope and quality even today. February 29, 2012 by S. P.
As its act of public worship, the Mass defines the Catholic Church – for good or bad. The Catechism of the Catholic Church notes, quoting Sacrosanctum concilium, “For it is in the liturgy, especially in the divine sacrifice of the Eucharist, that ‘the work of our redemption is accomplished,’ and it is through the liturgy especially that the faithful are enabled to express in their lives and manifest to others the mystery of Christ and the real nature of the true Church” (CCC 1067). Thus, the Mass must be considered with the utmost respect and reverence. It must not be treated as the playground of “innovation” and “experimentation.” Liturgical development should be a slow, methodical, and organic process which constantly maintains its link with Tradition. Bishop Marc Aillet provides us a compelling work on authentic liturgical reform in his book, The Old Mass and the New: Explaining the Motu Proprio Summorum Pontificum of Pope Benedict XVI (Ignatius Press, 2007, Softcover). Despite claims to the contrary, the Roman Catholic Rite has never been completely static. However, the change which occurred grew naturally from what was already present. Never was there a complete and wholesale overnight rewriting of the Mass. Such a move is not representative of true liturgical reform, and is certainly not representative of the wishes of Pope John XXIII and the fathers of the Second Vatican Council. As Bishop Aillet notes, “The motu proprio Summorum Pontificum…does not aim to reestablish the old Missal…But it is trying to invite pastors and faithful to take another look at the way they celebrate the liturgy according to the ordinary form of the Roman rite…So above and beyond a fatherly hand extended to those children of the Church attached to the old form of the Roman rite, turbulent and undisciplined but also often unjustly treated as they sometimes may be, the motu proprio constituters an invitation to everyone to rediscover the authentic meaning of the liturgy.” Bishop Aillet provides an important contribution to the discussion of authentic liturgical reform. This review was written as part of the Catholic book reviewer program from The Catholic Company. Visit The Catholic Company to find more information on The Old Mass and the New. They are also a great source for a baptism gifts or first communion gifts.